The Legal Genealogist was one of many long-time 23andMe customers who got the email this past week. The one that leaves me (a) doubtful and (b) yawning. First off, this is something that’s been talked about for so long that it’s hard to believe it’s actually going to happen. It’s been almost a year since 23andMe started telling its long-time users that the company was considering how it was going to transition older tests to its new reporting platform. First, it said it wasn’t sure whether it would happen at all and, if so, what might transition (and what wouldn’t). But, in the interim, those of us who’d already tested lost all of the introductions we’d sent out to others who’d already tested, and we weren’t able to even try to contact people who’d tested without using some type of username. So forgive me if I say, with some rather large degree of cynicism: I’ll believe this when I see it. We do need to be aware of what the changes are. And, frankly, that’s the yawning part. 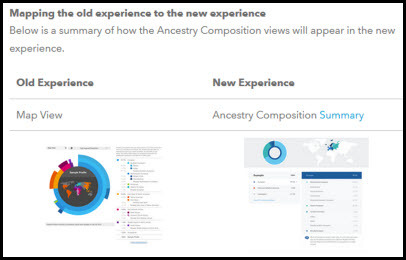 Folks who tested even earlier, on the V1 or V2 chips, will have access to “most” but not all wellness and traits reports and all ancestry reports, but not carrier status reports, and there’s no statement yet as to what “most” means in this context. Second, one big improvement is that we can all opt for open sharing where we won’t have to go through the cumbersome process of sending sharing invitations and hoping somebody sees them and responds. If even a fraction of the 23andMe users will opt for open sharing, this will make 23andMe much more useful to genealogists than it has been in the past. You can see a detailed explanation of all the changes in the 23andMe help section for “The New 23andMe.” The specific page for “Mapping features from the original 23andMe to the new 23andMe” provides the most detail about what stays, what goes and what changes are being made. And it makes it clear that we need to remember that there are some things that we’re going to lose when this changeover comes. One of them is pure and simple a toy: it’s called DNA Melody and it’s a fun representation of our DNA signature in a musical presentation. The link to that right now can be found, after you log in to your account, at https://www.23andme.com/you/labs/music/. And you can download all the files associated with your account if you’d like to keep them. I did, so I’ll always know that my DNA on the sitar sounds like this. Okay, so I’m a geek. Just be prepared for this changeover. Because — who knows? This time, it just might happen. This only applies to the US. From what I can gather people in the other 55 countries where 23andMe sell their test have received no communications from 23andMe at all other than having a purple banner splashed across their DNA Relatives page saying that the transition was imminent. Some people are reporting that this banner has now disappeared completely. Not even everyone in the US has gotten the email. So it’s all a “stand by and see what happens” situation everywhere. No e-mail for me yet and I checked Spam folder on the off-chance it went there. As a V3 tester, I gave up on coming soon months ago. Still have the splash screeny and I am not hopeful it will be anytime soon. Heard too many horror stories about people being banned from the new forums because they criticized 23andMe. With the old forums, criticizing 23andMe was allowed. I have not received the letter but I wonder. I originally tested with the V2 chip and then upgraded to the V3 chip. So I’m not sure whether I’ll have the health information related to the V2 or V3 chip or both. Maybe they are confused also and that is why I haven’t received any notification. They’re confused, all right, but I suspect you’ll get the V3 information. It’s probably a lot of back and forth with the FDA. Probably about “labelling” which is any written stuff accompanying a medical device, pharmaceutical product such as advertising, all the written material accompanying 23andMe, printing on mailing containers, instructions how to spit or scrape, results, words on pens, words on any advertising such as stickers, package inserts, patient handouts, wall charts, canvas bags, etc etc etc. Been there, done that. I think it’s more a matter of the IT requirements of shifting people over from one reporting platform to another. My son, adopted from Vietnam as a baby, recently received the results of his 23andMe DNA test. Robert is trying to find genetic relatives. His closest DNA Relatives, so far, are a 2nd-3rd male cousin “Anonymous” and five 3rd-5th cousins, two of them also “Anonymous”. Last evening, at his request I sent messages to these six individuals. Today we were very pleased to hear back from two of those who had given their names on the 23andMe website. We are most hopeful that the closer related cousin will respond soon too. After reading this blog, I’m wondering if our messages to the three Anonymous DNA relatives would have been sent to them by 23andMe and if so, if they can respond with no difficulty. Since Robert is a new user of 23andMe and since these relative were listed, even though they must want to remain generally anonymous, I’m hoping that they are “in the system”. Does anyone know how this works? I’ve been a member of 23andMe for a couple of years (I joined just after the FDA ruling against giving medical information), but I haven’t followed all the changes in their website. It looks like there’s at least a chance that the anonymous folks will receive sharing requests. See this explanation of the privacy settings. The New Experience TNE is not something I am looking forward to. I seldom visit 23 and once I am transitioned I would imagine it will be even less. Take the best thing in the Genetic Genealogy Community and gut it, dumb it down and make it more difficult to navigate. Its like taking a box of cracker jacks, remove the prize, remove the peanuts, shrink the box and give you have as much and then try to sell it for twice the price and make it sound like its really oh so good….. In 2014, CeCe Moore organized a genetic genealogy conference in Washington, DC that featured speakers from 23andMe. At that time it was incredibly encouraging to hear how sincerely interested they were in the family historian’s user experience (more so than one of their primary competitors). Unfortunately, since that time the site’s genealogy components feel like they’ve been neglected. A disappointing change. And the music thing tells me “feature not available”. I tested back in January or February 2016. My home page changed within the last few weeks to show a better summary of my information. You tested under the new system, so none of this applies to you.